As an organization with members and clinics across the country, the SMGA relies on individuals dedicated to the mission of our programs for success. Those people recruit potential members, organize chapter events, and volunteer their time, and all of their work widens our impact on those who can improve their quality of life through the game of golf. One such member is retired Operations Sgt. Maj. Lee Baleme. 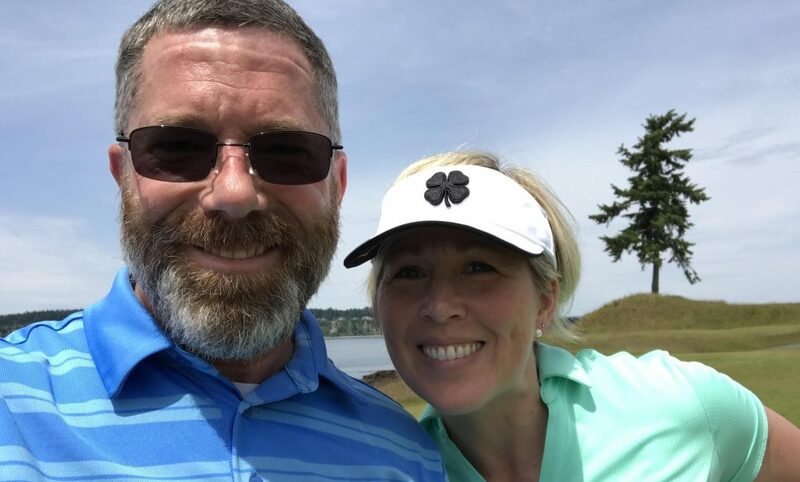 He is a center-point for the SMGA’s Joint Base Lewis-McChord chapter in the Seattle-Tacoma area, organizing and collaborating with the professional staff at former US Open host Chambers Bay to bring golf into the lives of servicemen and women at a world-class facility. His commitment has helped dozens of veterans use golf as an outlet for their conditions. And as a bonus, the game has worked wonders for him, too. Baleme admits it can be hard to let go and relax, but the mixture of Chambers’ idyllic surroundings and some sage advice from the instructors have made all the difference for him. “You know, we as soldiers and service members that have this thing, this invisible injury called [post-traumatic stress disorder], we hold onto that experience because it was so profound in our lives,” Baleme explains. “It made us successful, it made us advance in our organization in the military. Something that Ryan and Jorge and Brent, something they say in their clinics resonates with me, and it’s so simple, and it applies so much when you’re thinking of PTS: You get a lot more out of life when you just loosen your grip. 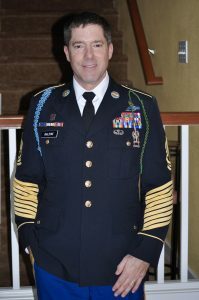 Baleme served 28 years in the Army, deployed to Iraq multiple times, and worked as a paratrooper and an instructor in strategic counterinsurgency. He finished his career at Joint Base Lewis-McChord as the operations sergeant major of the 4th Battalion, 9th Infantry Regiment and stayed in the area after his retirement. He now serves as the outreach coordinator for the Wounded Warrior Project’s Seattle office. His post-military career allows him to interact and impact veterans every day, and he doesn’t take it for granted. “I am truly blessed to have the opportunities that I have to reach out to people, create opportunities for people to get out and connect with one another, and get out of that dark place in their head,” he explains. That enthusiasm shines through, and the SMGA chapter organizers at Chambers Bay have noticed. The range fills up with veteran families on Saturday mornings in no small part because Baleme is a good golfer and a better recruiter. Baleme, as he explains, stumbled into his introduction to the SMGA. As a lifelong golfer, he was looking for opportunities to play, but didn’t believe that an organization could give as much as the SMGA said it could. After a friend urged him to send in an application, he connected with the administration and called their bluff by asking to complete the American Golfer Program at Chambers Bay, which had just hosted the US Open. To his surprise, they fulfilled the request and hooked him up with current Director of Golf Brent Zepp. The chemistry between teacher and player was immediate. 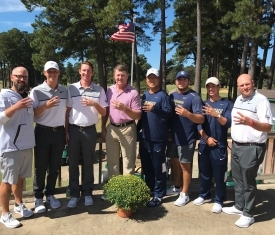 The GW golf team traveled to Chambers Bay at the beginning of April to compete in the University of Seattle’s Redhawk Intercollegiate, and Baleme visited with the team during the event. He must have said something to fire them up, because the team has been unstoppable since then. The Colonials took third out of 17 teams at Chambers, while junior Logan Lowe racked up his second individual victory of the year with a birdie on the first playoff hole. The very next tournament, at Navy’s Spring Invitational, the team won its first event since the 2012 Atlantic 10 Championship, and senior Jack Porcelli earned his first career individual win in his last career regular season start. The team will hope to continue their hot streak at this weekend’s conference championship in Orlando, and the Warrior Tribute bag will go with them. All three seniors, Porcelli, Christian Cichan, and Vince Palazzolo, will have a chance to carry it for one round at the event. Regardless of the outcome, the impact that the Warrior Tribute honorees and the GW team have had on each other will not soon be forgotten.